Can you identify the person on stage in this photograph? 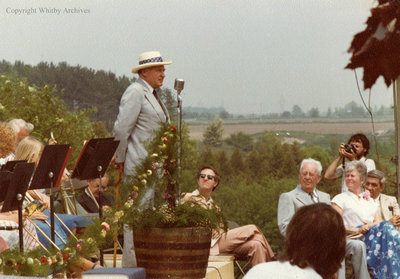 A colour photograph of an unidentified person addressing the crowd at the opening ceremony of Cullen Gardens and Miniature Village on May 30, 1980. Opening of Cullen Gardens and Miniature Village, May 30, 1980, Photographer Unknown. Whitby Archives A2013_042_279.